Welcome to Asker Wind Band! Asker Wind Band (Asker Musikkorps, AMK) is a versatile and well run wind band with passionate and dedicated members. Our current conductor is Erling J. Myrseth. Asker Wind Band consists of approximately 60 amateur musicians from 15 – 70 years of age. The band is aiming for a full concert band / symphonic band instrumentation. We are located in Asker, some 20 km west of Oslo with members from the central Oslo/Akershus region. The band is a member of the Norwegian Band Federation. Asker Wind Band was founded in 1932 and has performed continuously with exception of the war years. We are by no means close to retirement, as approximately 1/3rd of the members are in the ages 15-20 years. 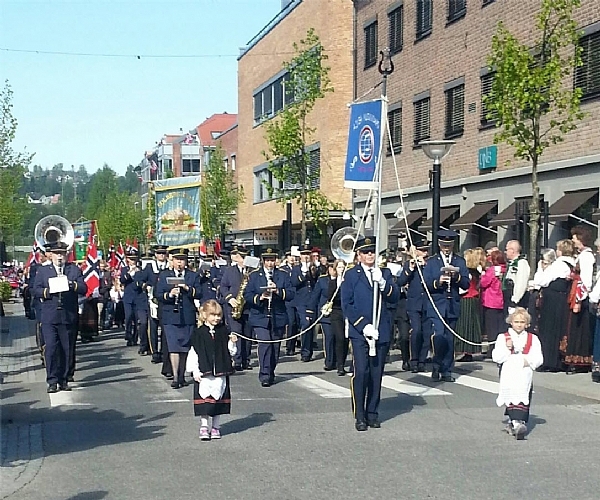 Asker Wind Band performs at a variety of events, from local outdoor concerts to the Norwegian National Championships. During one season, from late August to mid June, we give 5 - 6 major performances as well as several minor events and parades. 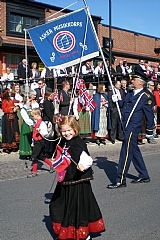 We are always at the front of the 17th of May (Constitution Day) parade in Asker, greeting the Crown Prince family at their residence, Skaugum, in Asker. No matter what the event is, our goal is always to deliver quality to both the audience and our members. In addition to musical excellence, we place emphasis on a good social environment in which members from all age groups thrive and flourishes. On these pages, you find more information about the band. Most of the pages are in Norwegian, but let that be a small challenge! We have included this brief summary in English to get you started. Some of the pages are for members only, in case you encounter a login function. Should you like to get in touch with us, please contact Frode by E-mail: frode wold@posten.no. Should you by any chance pass Asker on a Thursday, feel free to drop in on our rehearsal which usually is from 19-22 in Asker Cultural Centre.